Some time ago I set up a Facebook page, The Dorfprozelten Diaspora, for those whose ancestors came from this Bavarian village. New members to the group are asked for their link to the village and who their ancestors were. The village of Dorfprozelten is situated on the River Main which formed the boundary between Bavaria and Baden. Two weekends ago a new member, Keith, joined the group and to my delight it seems likely that we are distant cousins. Keith’s family had a German certificate which was translated as “some sort of acknowledgement for having conscripted others, not his own conscription record”. This document indicated his great-grandfather had been born in Dorfprozelten. We’ve still got to achieve further verification via death/marriage certificates but so far the indications are that Keith and my Dad share a 5th great grandparent, Adam Happ. Admittedly, at this distance it seems such a tenuous connection but thanks to the wonderful German record-keeping and the oft-lauded local history, Dorfprozelten Teil II by Georg Veh[i], it’s actually possible to link families up over three centuries, and to track their history. I’ve “fixed” my header photo for these posts so you can see what the village looks like in context. The Happ family were one of the early inn-keeper families in Dorfprozelten, and their ownership dates back at least to circa 1750 when (Johann) Martin Happ ran Das Goldene Fass. This Martin’s son, another Johann Martin Happ II, inherited it from him, followed by Johann Martin II’s daughter, Eva Catharina later Ulrich and Kunkel, my own 3xgreat grandmother. 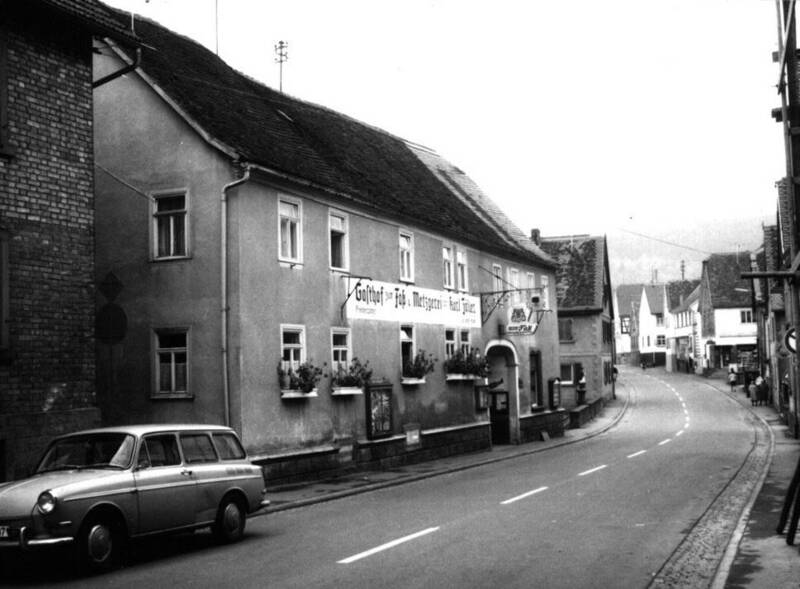 Meanwhile just across the street, Martin’s brother, Johann Happ was running the Gasthaus zum Anker. Johann and Martin’s father was Adam Happ but his occupation is unknown. The Anker passed from Johann to his son Nikolaus Happ, then was transferred to the family of Johann Anton Zöller…who knows why…perhaps it’s part of the German text I’m struggling with. 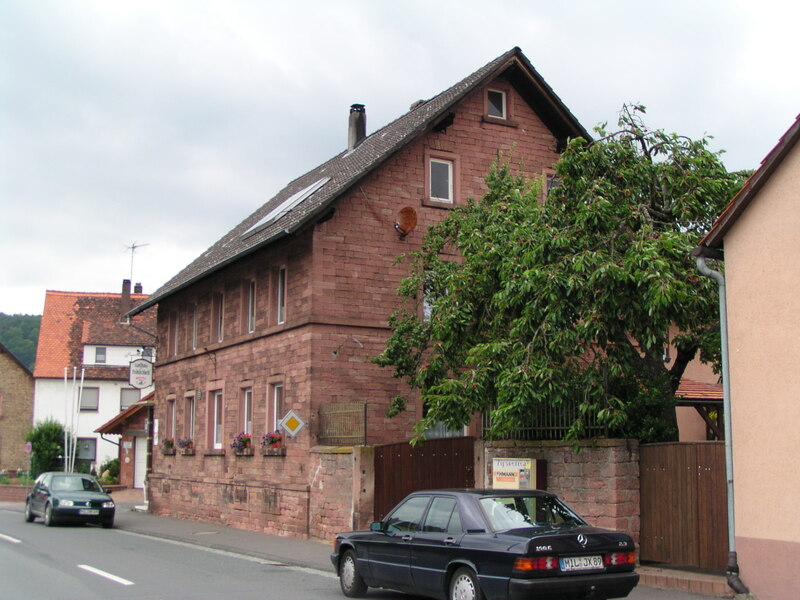 In the 1860s, Nikolaus’s son Michael Happ established a new guesthouse called Die Fröhlichkeit, built from the local pink sandstone taken from the cliffs adjoining the village. Michael is documented as an economist as well as a guesthouse keeper, which I think is quite interesting…how did it come to be that he was an economist at that time? Where had he studied? Other references in Veh’s book indicate that Michael was fairly well off and also served as Bürgermeister (mayor) from 1856-1863. Michael Happ married Catharina Zöller and had the following children who survived to adulthood: Anna Apollonia (1835-1892) emigrated to USA; Maria Antonia (1840-1915) who took over the guesthouse; Julius (1844-1923) emigrated USA; Ernst (1847-1865); Corbinian (1849-1905) and Raimund (1852-) emigrated to USA. In such a small village as Dorfprozelten everyone would have known each other, and I assume, also known their relationships. This interests me especially because Anna Apollonia was almost exactly a year younger than my 2xgreat grandfather Georg Matthias Kunkel so not only would they have known each other, they may have played together and also attended school together. Siblings Anna and Raimund Happ emigrated to the USA and newspaper notices of 30 August 1869 indicate their imminent departure from their home village. Anna and Raymund/Raimund arrived in New York ex Bremen on the ship Main (ironic since that’s the river on which they had lived in Bavaria), on 4 October 1869. Initially I couldn’t help wondering why Anna didn’t stay to take over the running of the inn. However, the discovery of Anna’s marriage to another Dorfprozelten emigrant, Franz Michael Scheubner, made it apparent why she had decided to leave her home village. The marriage occurred in New York on 24 October 1869, shortly after Anna’s arrival. It is indexed in the New York Marriages 1686-1980 under Scheibner, a further reference to Veh’s book clearly correlated to Scheubner rather than Scheibner: his parents were Sebastian Scheibner and Anna Maria Rheinthaler and Anna’s are also correctly shown as Michael Happ and Catherine Zöller. Like many Germans, Franz Michael was more typically known by his second name, Michael, and this is how he appears in records in the US, other than his immigration record. He arrived in New York on the ship Union, on 8 May 1869, aged 30, and this document[ii] uses Franz, probably because this is how his baptism was recorded. So now my question is why Anna brought her younger brother, Raimund, with her when she emigrated, rather than why she herself emigrated. It seems from all the records I’ve found that the couple lived in Manhattan through their life together. In the 1870 US Federal census[iii], Michael and Anna were living in New York Ward 17, District 21. Michael was shown as a cook. Their surname has been misindexed as Scheibner. By the 1880 Federal census[iv], Michael and Anna had two children, Frederick Scheubner aged 4 and Kathe aged 1 (probably Catherine after her mother) and were living on the east side of 16th Street, Manhattan. There were plenty of Bavarians living close by but it’s interesting that Michael showed their origins as German. Michael was working as a cook in a hotel and had dropped 7 years from his age. Despite my best efforts and searching across multiple sites, I have been unable to locate any of the Scheubner family in the 1890 Federal census or the 1892 New York census. I am assuming that it has been mis-indexed, though even using wildcards or first names they have still eluded me. As it’s not my direct family I’ve had to put it aside for now rather than spend more time on it. On the 1900 census I found a Michael Scheubner living with his wife Katie at 61 Grand St between Wooster St and West Broadway, Manhattan[vi]. Michael is 50 and lists his birthdate as August 1849 (rather than July 1838) and arrived in the USA in 1870, having been there for 30 years. Katie, his wife, is also German-born and enumerated as aged 30, even though she supposedly arrived in 1869 and had been in the US for 31 years….obviously some error there. They had been married eight years (soon after Anna’s death in 1892?) and had two children, but neither was alive. Michael is working as a cook, which is why it’s tempting to think he’s the right man. 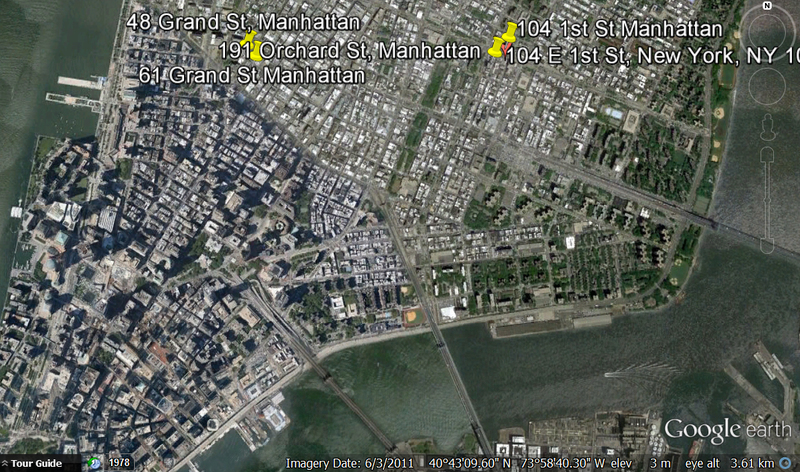 Oops forgot this before…the Manhattan residences of the Scheubners. I knew from Dorfprozelten Teil II (page 229) that Anna Happ (Scheubner) had died on 14 February 1892 in the USA, though there is no mention of her married name. Indexes on Ancestry record her death on 12 February 1892, aged 56 in Manhattan. [viii]She died the day after her 56th birthday. It seems it may be “our” Michael who died in 1905, also in Manhattan, aged 63[ix]. Michael is rather more prone to providing variable dates of birth. I have done preliminary searches for the children Frederick and Kathe (Catherine?) Scheubner without success. Throughout this research I’ve been cross-referring between Family Search, Ancestry.com, MyHeritage.com and Archives.com. Please join me for Part II of this story as I reveal what happened to Raymond and his brother Julius in the USA. For the record, this is my 600th post to this blog…whew! FYI: When reading German references I particularly like the Reverso online dictionary. You can even use it to translate sentences. [i] Dorfprozelten am Main Teil II. Veh, G, Benedict Press, 2002. See pages 41, 143-144, 198-199, 192-193, 213-214 , 229, 23-239 for the families mentioned in this story. [ii] Year: 1869; Arrival: New York, New York; Microfilm Serial: M237, 1820-1897; Microfilm Roll: Roll 310; Line: 27; List Number: 457. [v] Ancestry.com. U.S. City Directories, 1821-1989 [database on-line]. Provo, UT, USA: Ancestry.com Operations, Inc., 2011. [vi] Year: 1900; Census Place: Manhattan, New York, New York; Roll: 1080; Page: 17B; Enumeration District: 0012; FHL microfilm: 1241080. [viii] Ancestry.com. New York, New York, Death Index, 1862-1948 [database on-line]. Provo, UT, USA: Ancestry.com Operations, Inc., 2014.Original data: Index to New York City Deaths 1862-1948. Indices prepared by the Italian Genealogical Group and the German Genealogy Group, and used with permission of the New York City Department of Records/Municipal Archives. Certificate 5447 can be ordered. This entry was posted in Dorfprozelten research, Kunkel Family History, United States Research and tagged Anna Happ, Dorfprozelten, Froehlichkeit, Goldenes Fass, Happ family, Michael Scheubner, Raymond Happ, zum Anker by cassmob. Bookmark the permalink. In the 19th century, “economist” (“Ökonom” in German) simply was an elaborate denomination for a (perhaps well-off or big) farmer. Hope this helps.